The electoral commission has postponed the ballot to 23 January as demanded by the opposition. However, protests continue in the capital to press for reforms necessary for transparent elections. 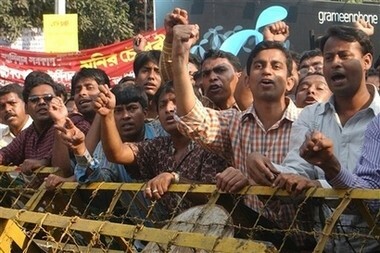 The AL, a coalition of 14 opposition parties, has been holding vigorous nationwide protests for weeks: it has accused the EC of favouring the BNP, the outgoing ruling party. Protesters wanted the date of the polls to be shifted to allow enough time to apply reforms necessary to conduct free and transparent elections. Under the Bangladesh constitution, at the end of its mandate, the elected government should hand over to a caretaker administration, which is required to hold elections within 90 days. The term of the current interim authority – led by the President of Bangladesh Iajuddin Ahmed - expires on January 25. Thousands of opposition supporters today staged a demonstration close to the EC offices to call for electoral reforms: one of the opposition requests is the updating of the electoral register, which allegedly includes fictitious names and even those of dead people.